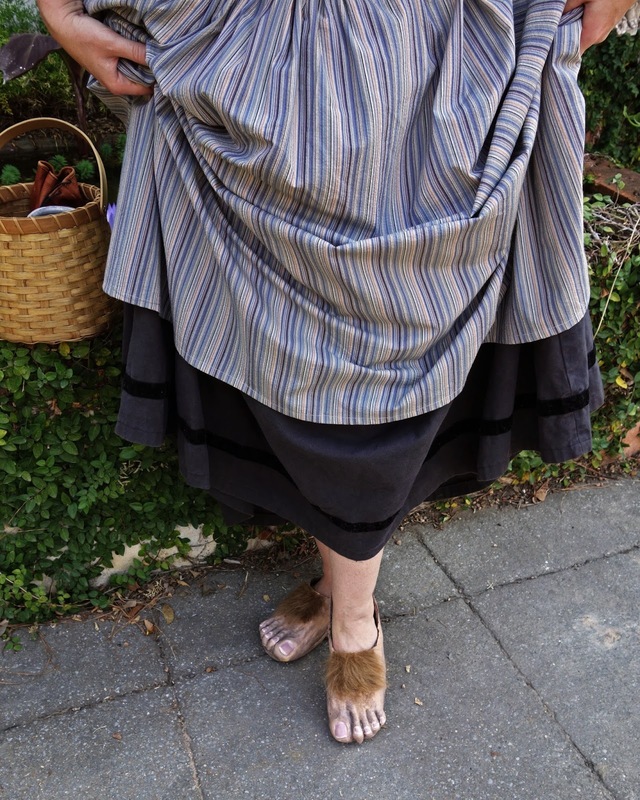 This year for our annual family trip to the Renaissance Faire, I decided to make myself a hobbit costume. 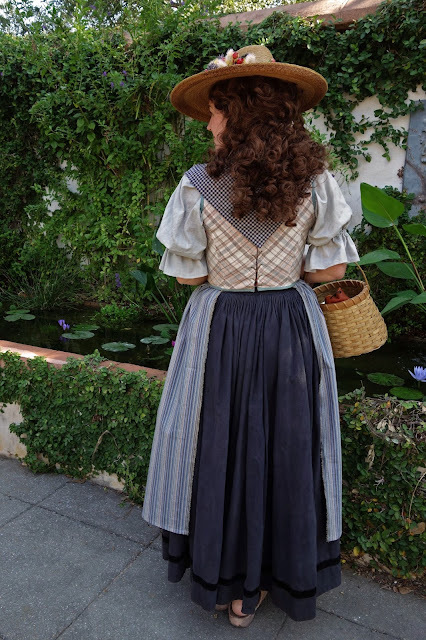 The theme for the weekend was Octoberfest, and since the female hobbit costumes from the Lord of the Rings trilogy are very dirndl-like, it seemed like a fitting choice. I also have to confess that I've been daydreaming about a hobbit dress ever since Sarah from the Romantic History blog made her beautiful hobbit gown a few years ago. Sarah makes hobbit fashion look SO GOOD! Plus, with my love of home, food, and non-adventure, I've always identified with hobbits, so it was great fun to finally get to dress up like one! 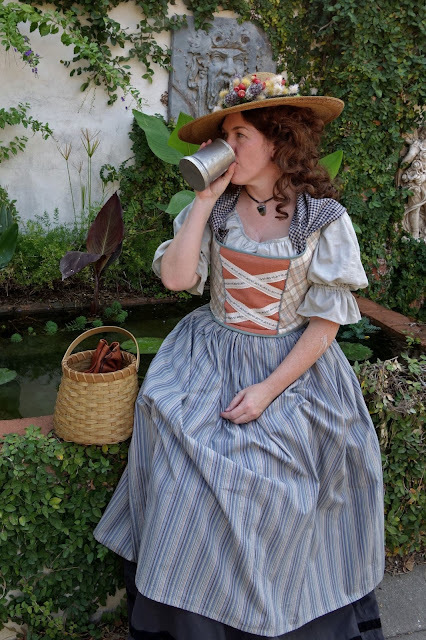 I started by looking through a bunch of screen caps from the movies and I modeled my dress after some of the styles that I spotted on various hobbit ladies. 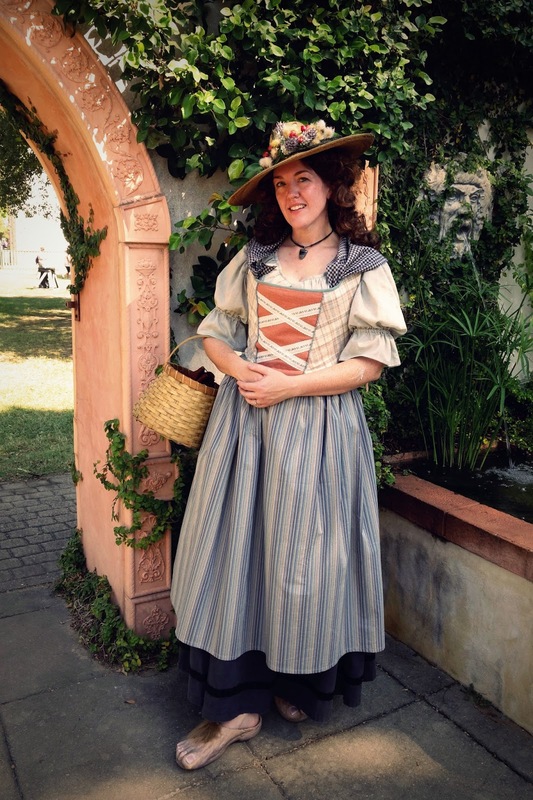 My bodice is made of plaid wool cut on the bias, and the front panel is made from contrasting linen fabric with flowered ribbons criss-crossing across the front, similar to the lady on the right of this screenshot. Like most of the LotR hobbit bodices, mine laces up the back, is bound around the edges with a contrasting fabric, and has decorative trim at the edges of the front panel. I used my old 16th c. bodice pattern to make my bodice, and I decided to add a few strips of cable ties to the front panel to keep it smooth. 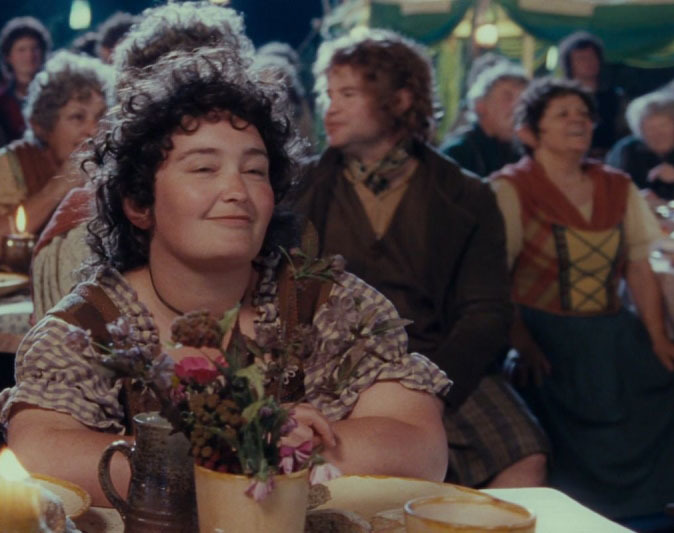 Almost all of the hobbit ladies in the film are wearing short-sleeved blouses with a ruffle at the cuff. Most of these blouses are a pale color instead of white, and some are embroidered or have a woven pattern. My blouse is made of pale green cotton with a subtle woven stripe, and I used a 1980's peasant blouse pattern to construct it. 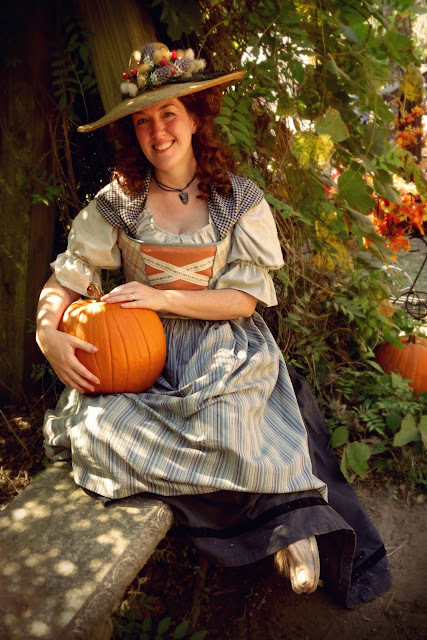 My skirt was an older piece that I've had since I first started going to faires, but I dressed it up by adding an apron made out of striped blue and peach cotton. I also wore a gingham kerchief around my shoulders to add another layer to the mixed-matched look. 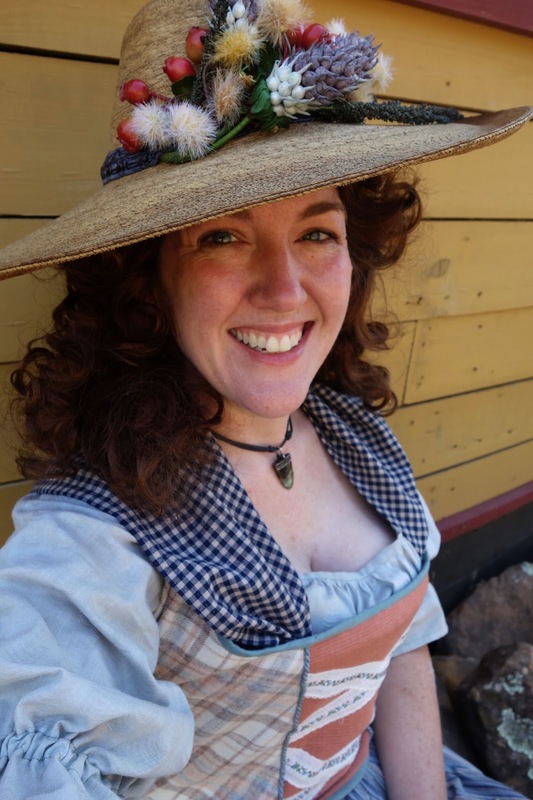 It was really fun combining so many colors and patterns in one outfit, and I think it gave my dress a fittingly rustic feel. Several of the hobbit women in the movie wear new-agey looking pendants on leather cords, so I picked out one of my husband's old stone necklaces to wear. I originally planned on picking out something more dainty to buy while I was the faire, but I liked getting a chance to wear this one, so in the end I decided not to switch. 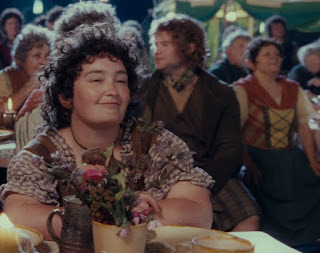 Hobbit hair is always curly, and most of the women have bangs or shorter layers on top. 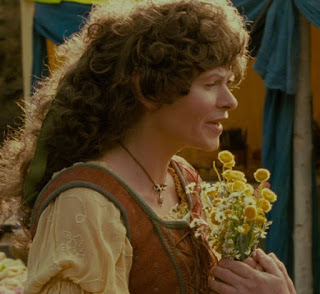 I bought the Delihla wig by Mona Lisa for this costume, and think it worked perfectly for hobbit hair. I was very pleased with the quality of this wig, and I got complements on my hair all day - I think I need to start wearing this wig all the time! I don't remember seeing any of the women in the first LotR movies wearing a hat (they do wear them in the Hobbit trilogy, but those hobbit costumes are more like 18th c. fashions), but I decided to add one for sun protection since it was going to be such a hot day. I decorated a vintage straw hat that I found in an antique shop with a bit of trim and a cluster of flowers. I LOVE my hat! It's definitely my favorite part of this costume. And of course you can't be a hobbit without a pair of big hairy feet, so I ordered a pair of child-sized rubber hobbit feet and stitched them to a pair of my old leather clogs. I got the idea from this tutorial for hobbit shoes, but I thought that the child-sized feet wouldn't be so big that I would trip over them all day. After they were attached to my shoes, I repainted them with acrylic paint to make them look more realistic. They were obviously fakes if you look close enough, but I left my skirt pretty long so that you would mostly just see the toes peeking out as I walked, and I was pretty happy with the effect. 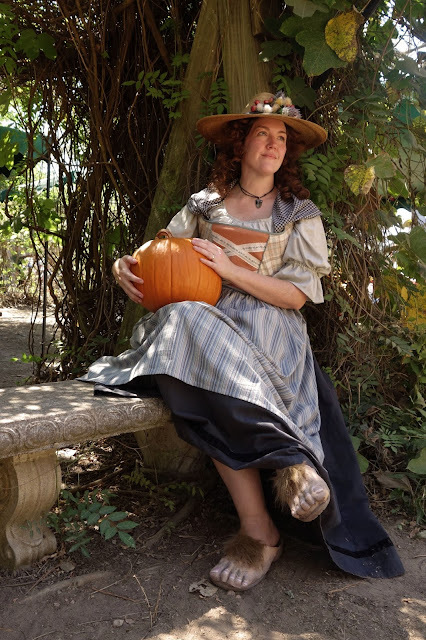 Here are a few more pictures from my day at faire, and you can see some additional shots on Flickr. Your hat skills are out of this world! You look absolutely adorable. I've always imagined you as more of an Elf since they are far more regal and otherworldly, but I must admit you make a most excellent and admirable Hobbit ;-)))). Everything about your costume is oh so perfect from the flowers on your hat all the way down to your hairy hobbit toes. It looks like it must have been a fun day! This is so adorable and Hobbit-y Jen!! You did a most wonderful job of making this outfit. 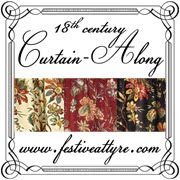 I love all the colors, fabric patterns, and textures. Your hat is fabulous as well! Job very well done!